The LAPD is ordering more than 3,000 smart Tasers that will activate body cams. LAPD officers will wear body cams made by Taser that activate when officers discharge their Taser X26P Smart Weapons. The Los Angeles Police Department has ordered 3,000 Taser X26P Smart Weapons that, when discharged, will activate body cams, also made by Taser. Reuters reports that the LAPD, the third-largest municipal police department in the country, made the order Tuesday. 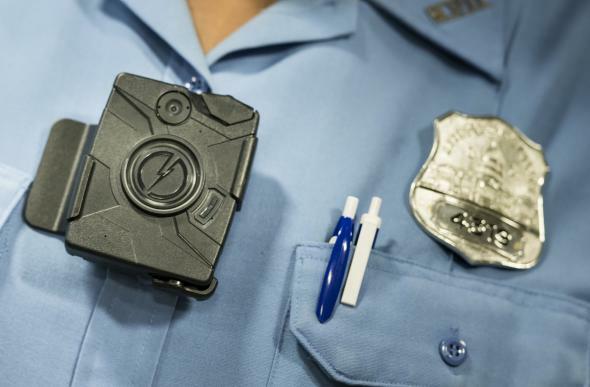 Discussion about these types of body cam systems has spread in the wake of the Michael Brown and Eric Garner shootings, and the Obama administration has proposed offering $75 million in federal funding for police purchase of body-worn cameras. The X26P Tasers purchased by the LAPD have onboard sensors that collect data in three categories. The “Event Logs” record the date, time, and duration of user actions related to the Taser, like activating the safety or firing the weapon. The “Engineering Logs” record sensor data related to the device itself, and the “Pulse Log” measures charge output. The idea of using a Taser discharge as a criterion for activating body cams is promising, especially as more and more police departments adopt body cams and struggle to establish guidelines for when they should be on or off. The Los Angeles Police Department is committed to implementing safety measures to reduce the risk of injuries to both our officers and the members of our community, while improving trust within our communities. In addition to these new Taser deployments, we plan to issue a body-worn camera and a Taser device to every officer. It is our goal to make these important tools available to every front line officer over the next few years. In a piece last month, Ars Technica pointed out the struggles to get effective body cam guidelines off the ground. Cyrus Farivar looked at how 24 officers in Oakland, California, were disciplined over the last two years for failing to turn on, or in one case turning off, their body cams. Taser discharges aren’t the only time body cam activation is important, but the idea of automating the process of turning the camera on seems like a reasonable way to ensure it will capture footage that might later be important.